Later the flowers form as skinny long white trumpets and at dusk they perfume the air. Hopefully there are no strong winds to blow them down! Their seed pods start to form from January on, along with new flowers. The leaves retain their clean green appearance, though they get quite sticky, trapping flying insects. 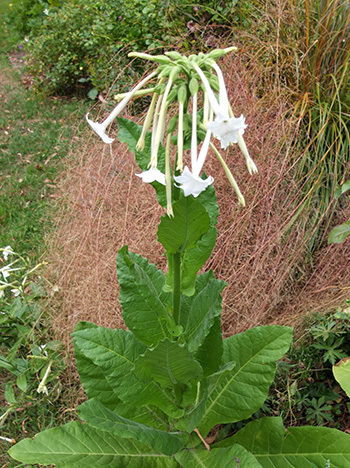 Apparently the leaves resemble commercial tobacco, to which Nicotiana Sylvestris is related. Nicotianas in the Vegetable Garden! These plants are big, growing to five or even six feet in height. The root systems are strong enough and the stems are thick enough for plants to happily lean out of borders at crazy angles. There are even some in my vegetable garden! I trim them in Autumn, and they quickly produce a rosette of fresh leaves for winter. Any frost damage just means another trim, with fresh spring growth resulting. 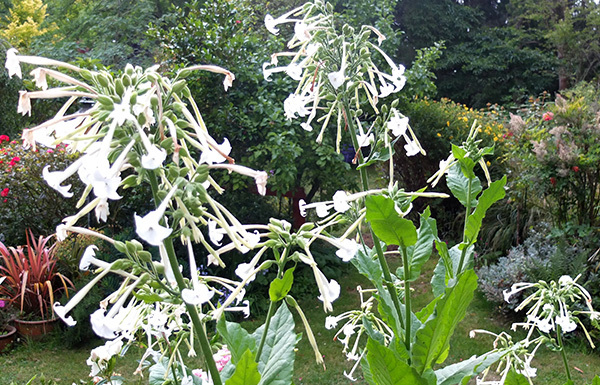 In my climate Nicotiana Sylvestris should be a short-lived perennial, but I find that the older plants are just as vigorous and just as beautiful as the fresh new ones. I produce new plants each spring from seeds I've collected, but I find self-sown plants everywhere. There are even some beautiful specimens growing inside the glass-house in the dirt floor. Oops.